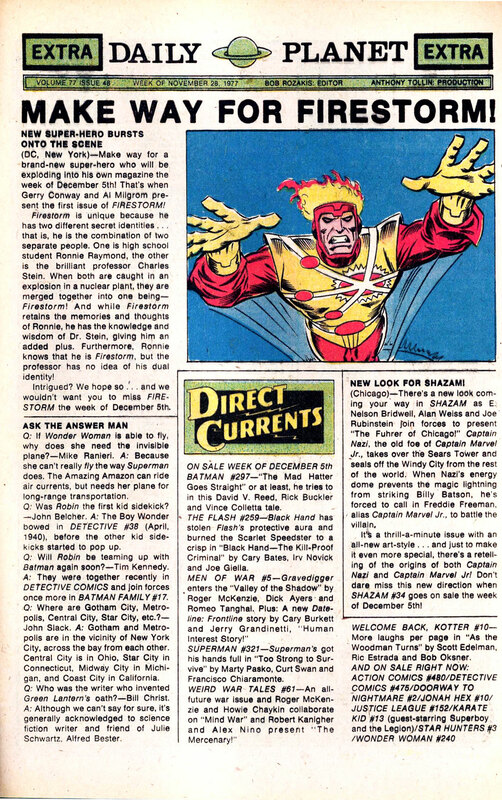 Firestorm made the front page of the Daily Planet! .. Well, sort of. During the Bronze Age, each issue of DC Comics contained an in-house promotional page called “Daily Planet”. The modern equivalent would be the Channel 52 strips or the DC Comics All Access pages. Each “Daily Planet” included information on upcoming releases and the ever-popular “Answer Man” column. The November 28, 1977 edition prominently featured our favorite Nuclear Man! This would have hit the shelves exactly one week before Firestorm #1 arrived. Did you notice the Professor Charles Stein comment above?!??! Believe it or not, this is the second reference to Charles Stein. The first appeared a week prior to this “Daily Planet” edition in an editorial by Jenette Kahn. The editorial appeared November 21, 1977 in Teen Titans #53 (and possibly other comics as well). Click here to read that editorial. Either Martin’s name changed sometime prior to the first issue hitting the shelves, or this error just kept popping up. Either way, it’s an interesting peek into the promotional launch for the original series! I came across this on Count Comics Tumblr, so my thanks to him! Posted in: Advertisements, Al Milgrom, Comic books, Firestorm #01: Original (Ronnie/Martin), Firestorm comic vol. I, Gerry Conway, Professor Martin Stein, Ronnie Raymond. Charles Stein, hee. I like Martin MUCH better. And I see that the Direct Currents also has a reference to Rick (sic) Buckler. It’s weird, as soon as I began reading your post, I could picture the page – Al Milgrom really set the Firestorm tone with that first cover. I like these so, sooo much better than the Channel 52 strips. Maybe in another one of the DC Earths, Firestorm was made up of “Charles” Stein and “Robby” Raymond.